The 2018 Design House opens tomorrow, May 5! 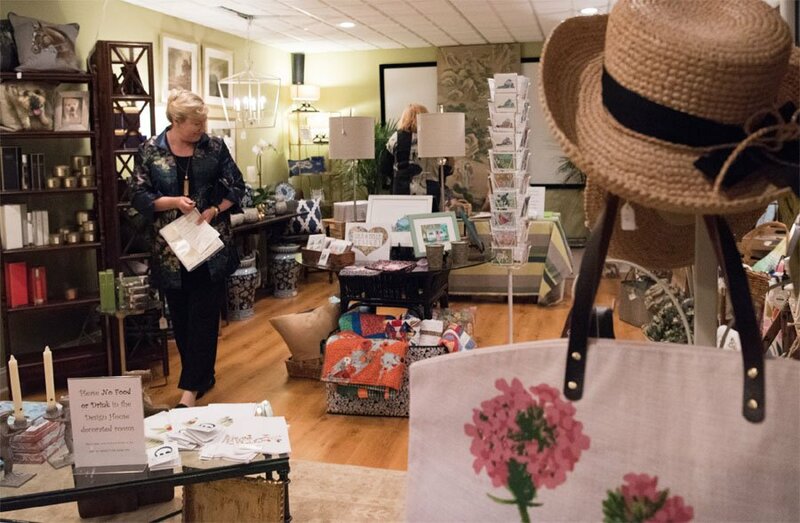 This popular fundraiser for the Shelter for Help in Emergency (SHE) features a local home that is transformed by talented area designers. The 2018 Design House, located off Garth Road, features the work of 13 interior designers, each assigned various rooms and spaces, along with two landscape designers. 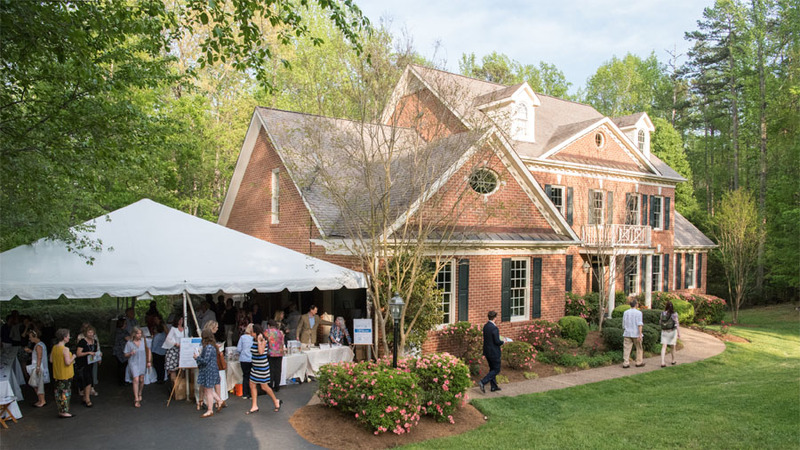 Charlottesville Wine & Country had a great time at the preview party last night, viewing this must-see home firsthand and having the opportunity to support such a worthy cause. 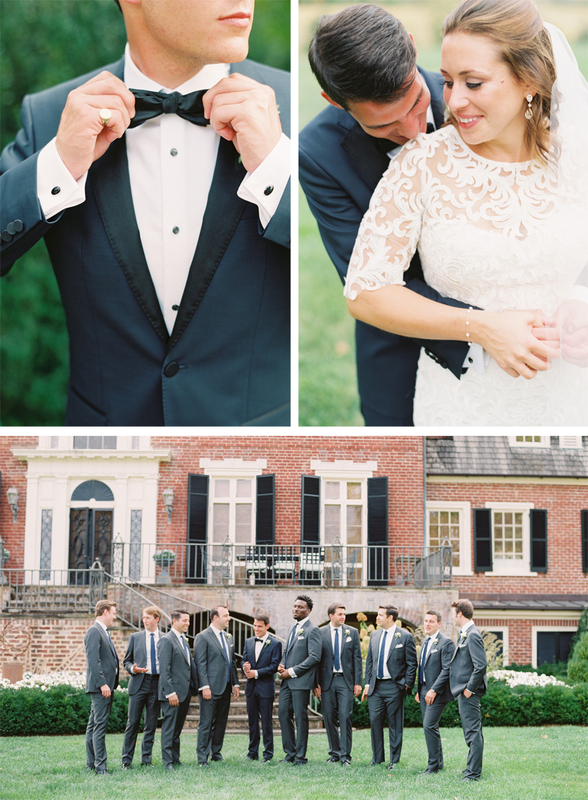 Entering this gorgeous home, guests will find it’s all about the drama. 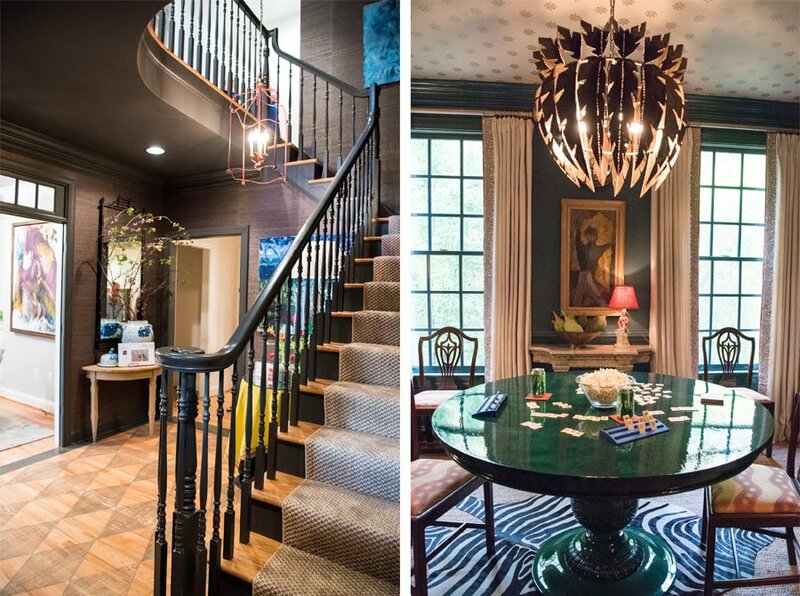 The striking foyer by Franny Hurt Design (below, left) is in a beautiful chocolate brown. We loved the space’s textured wallpaper and stenciled floors she chose. Moving to the right of the foyer, guests enter the stunning living room (below, right) designed beautifully by Chloe Ball of Kenny Ball Antiques and The Shade Shop. How gorgeous is this emerald green game table and show-stopping lamp at the far side of the room? The Inchyra Blue by Farrow & Ball walls allow the room’s antiques to really shine. To the right of the living room, guests will find a delightfully peaceful yet striking guest suite (below). 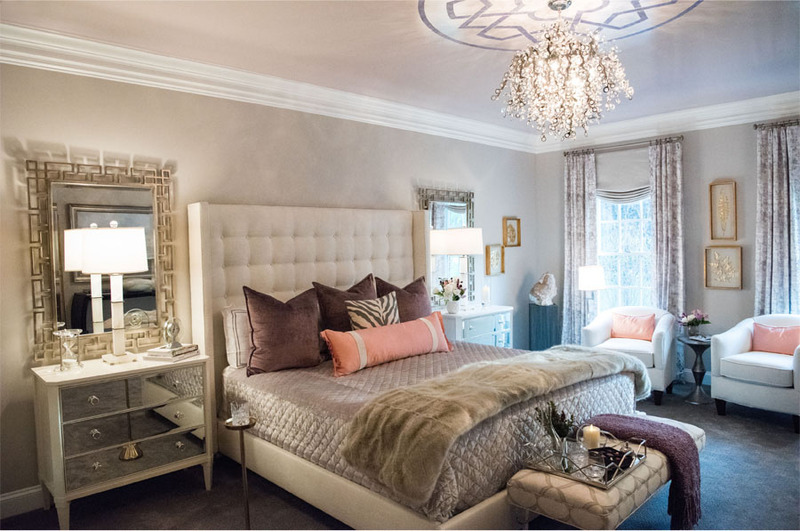 Inspired by the room’s natural lighting, Moyanne Harding of Interiors by Moyanne created a chic room and a bathroom you’ll love using the season’s hottest blush color palette. 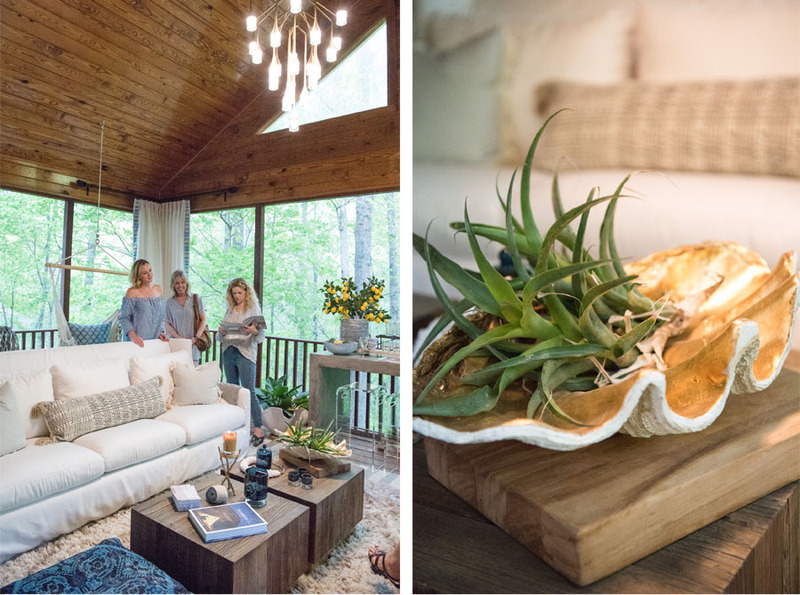 Guests walking through the beautiful kitchen will enter a must-see family room that connects to an incredible screened-in porch. When you enter, you’ll know why you want to see the colorful family room in person! But, we couldn’t resist sharing the amazing enclosed deck (below) designed by Caroline Minsky of The Artful Lodger. The space has a chic and casual Boho flare with cozy floor pillows and even a hanging hammock chair. Believe it or not, everything is in outdoor-friendly fabrics! Upstairs on the second floor, guests will find the spacious master bedroom suite designed by Cheryl Jarvis Southworth of Designs by Cheryl (below). This room was all about luxury and glamour. The gorgeous hand-painted stencil design by Diane Williams of Art to Di For on the ceiling must be seen in person. It’s stunning! This is only one of four gorgeous bedrooms guests will enjoy on the second floor. If you want to see the others, you’ll have to take the tour, and we promise it will be well worth it! For the working woman, guests will enjoy the fabulous home office to the right of the foyer—perfect for any #sheboss (below). 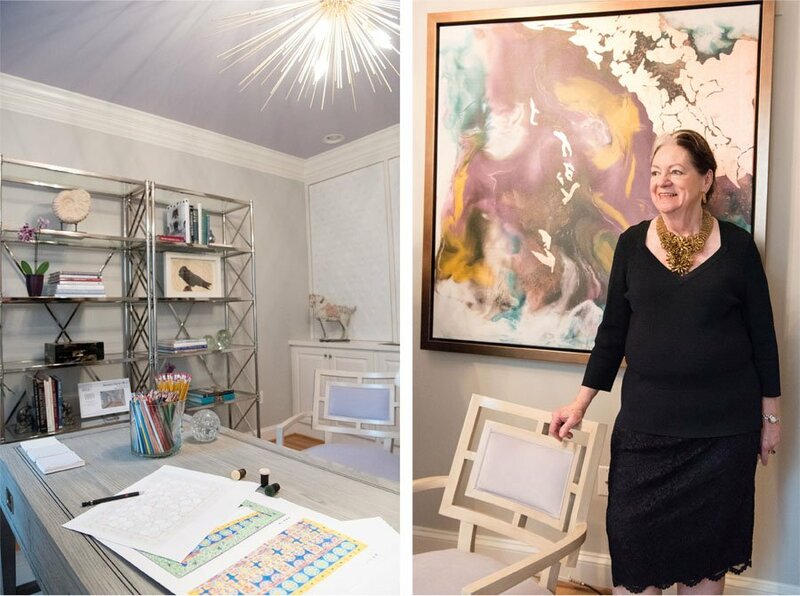 Andrea Gibson, ASID of the Gibson Design Group (pictured below, right) designed a graceful and professional space that can host clients as well as provide inspiration for the creative working woman. And, speaking of #sheboss, Ellen Beard of Patina Home created another space on the second floor that perfectly serves the creative woman. 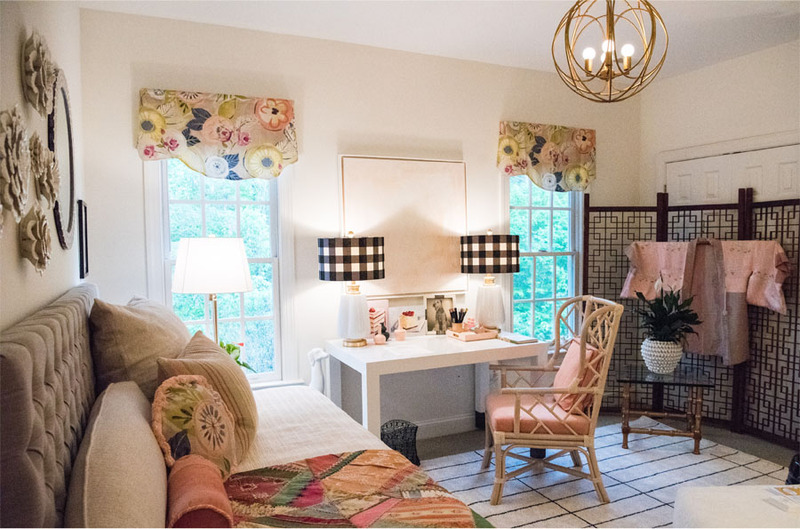 Her fresh and inviting craft room will effortlessly accommodate a guest who might spend the night as well. Wait until you see what she’s done with the closet! And, of course, the man of the house is not ignored! The third floor has an office retreat by Grand Home Furnishings, of which all men will be truly envious. As you tour all four levels of the house, be sure to visit the charming basement, where you can browse a delightful art gallery space with works by local artists, shop the Design House boutique and visit the Design House Café with light lunch and refreshment options. We cannot wait for you to see the extraordinary work by local designers showcased in this year’s Design House. The 2018 Design House will run May 5–20, from 10am–4pm each day, except Wednesdays and Thursdays which have extended hours from 10am–7pm. Parking is available at Olivet Presbyterian Church (2575 Garth Road, Charlottesville, VA) where shuttles are provided to take guests to the home. Tickets are available here, and you can visit cvilledesignhouse.com for more information about this wonderful and very worthwhile fundraising event. You don’t want to miss it!